We’re a theater of words and music. XXV Laulupidu, the Estonian song celebration: 30,000 singers, 80,000 listeners! There are only 15 of us. “I know that many groups do not think it is a big deal to be “on book “— that the music is the most important thing. With large choruses and orchestras, I reluctantly agree. Here are short bits of Victoriana, Tin Pan Alley, and more. Give a listen. bad puns, low humor, sweet spiritualism, all in one evening! Where Did You Find That Song? 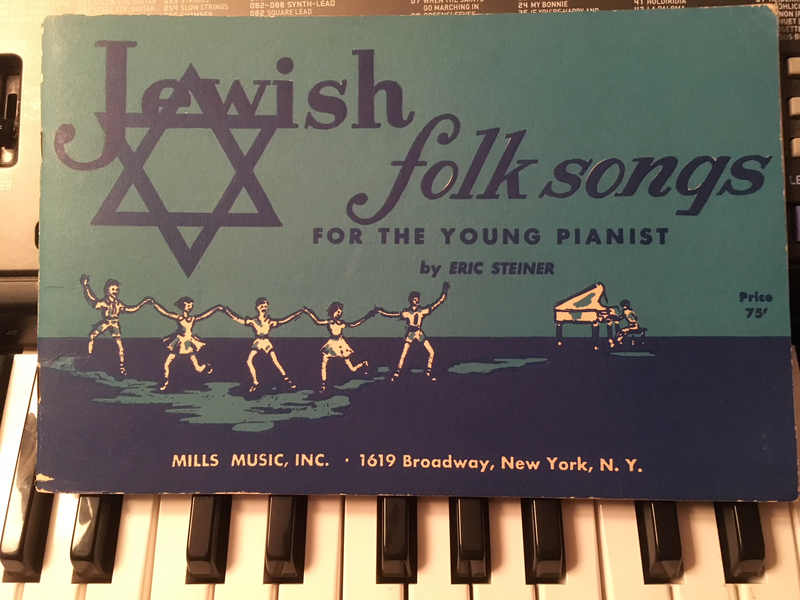 In 2014 I found, at such a sale in Rhinebeck, NY, a little book called “Jewish Folk Songs for the Young Pianist.” As the title suggests, it’s pitched to keyboard beginners, and the arrangements are very spare, just a melody and one or two notes in the left hand. All the songs have words, in Yiddish with a brief translation. And there are some great songs: the book has so far yielded up “Amol Is Geven a Mayse” (“Once Upon a Time”), which we sang in our “For Better or Voice” concerts, and now “Di Alte Kashe” (“The Old Question”) on our upcoming “Hook, Wine, and Thinker” program. Come hear us sing “Di Alte Kashe” in December and find out what the old question is that the world keeps asking us, but we can’t answer. The days are short now. It’s getting cold and depressing, but the Art Mob has its seasonal affective disorder under control, with a leafy pile of songs about the season: how it’s dark; how everything’s dying; how the weather portends the scriptural end of days … and makes us happy! Really. O, what remains, what lingers yet /To cheer me in the darkening hour? The grape remains, the friend of wit /In love and mirth of mighty power. We’ve got more songs, more music, more proven remedies for the blues. 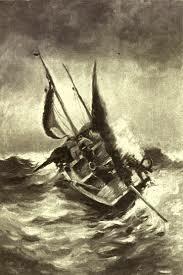 Fishing for Singers, Hook, Wine, and Thinker. 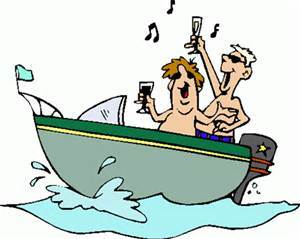 It’s September, and in line with our December concerts’ fishing/drinking theme, The Art Mob is trawling for new singers (especially tenors). You who receive this message: You already know how much fun you’ll have, so come on and join us. And if you know someone else who’d be interested, forward this message, or slip us his or her name and email address, and we’ll be right over with our nets. The rest of you: visit www.artmob.org and sample our audio clips, read all about us, write to Brent (he really wants to hear from you; see below) and get on board. Here’s how we describe our unpatented Art Mob process and program: Our song selections, which are made by consensus, are notoriously quirky and eclectic.If you like gospel, Victoriana, children’s ditties, jazz, and country songs along with who knows what other styles, you’ll feel right at home in The Art Mob. We rehearse every Monday evening. If you want to join in the fun, get in touch with our musical director, Brent Frederick. His email address: brent@brentfrederickmusic.com. Thanks to all who attended our Rockin’ the Boat concerts in December. We had a record crowd for the Friday performance! On Saturday we got a standing ovation! We are still feeling the love, and we’re sending it right back to you. Our next concert series is May 20-22. Watch for more news as those dates approach. The Art Mob has a new CD, called Hope is the Sing with Feathers. That was the theme of our May 15 concert series, and the CD contains all the songs from it. The Art Mob will be Rockin’ the Boat in three a cappella concerts at the Tenri Cultural Institute the first weekend in December. Drift along on a sea of musical pleasure, with songs that will bring waves of nostalgia, gales of laughter, and more. Tenri is at 43A W. 13th Street, New York, NY. The theme for The Art Mob’s December 2015 concert series is “Rockin’ the Boat,” and we’ve chosen a raft of wonderful songs about … well, use your imagination. As usual, we’ve chosen songs from a range of genres and eras for a program that we hope will make you laugh, sigh, maybe shed a tear or two, and yell for an encore. Rehearsals are underway. Stay tuned for information about when and where the concerts will be.